Event organizer Gary Brooks (center, in referee’s jersey) motivates the players during a timeout in the game. 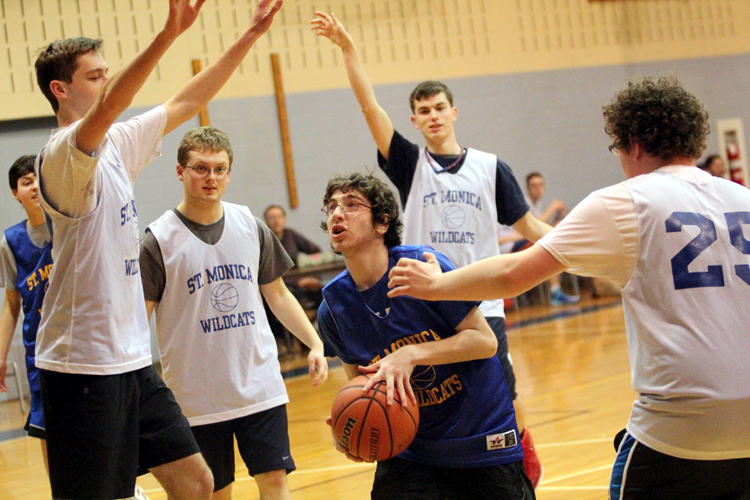 Players met each other’s forearms in the customary basketball greeting as their names echoed across the sound system before the final game of St. Monica Parish’s special needs basketball program. Responsive clapping and cheering from about 40 family members and friends filled the parish gymnasium in Berwyn Saturday night, Feb. 28. Started by Gary Brooks in response to adolescents with special needs excelling at the sport, the clinic taught basketball skills through drills and games for 16 special kids, beginning last December. The players deal with a variety of issues ranging from autism, a disorder causing difficulties in social communication, to attention deficit problems. Wendy Brooks, Gary’s wife, said from her spot at the scorer’s table that the program gave the kids an opportunity to play a sport they enjoyed and put them on par with any other child. The clinic also provided competitive basketball and socialization in the dreary winter months. Most of the teenagers know each other from a senior league baseball team Brooks coaches. The idea developed after Brooks and other parents decided a previous basketball league didn’t befit the abilities of a handful of teenagers showing better potential at the game. “I think I could put something together here,” Brooks recalled telling the parents. 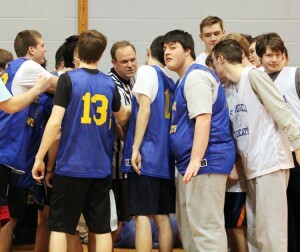 On Saturday night he donned a white-and-black referee jersey and instructed players to positions on the court. The effect of the program was evident. 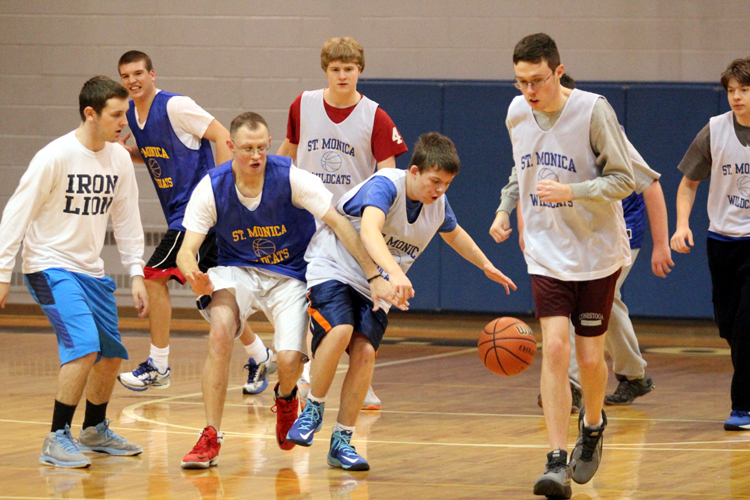 “Look at their faces,” said Steve Pealer, a St. Monica parishioner and coach of its high school CYO team. Smiles of the players extended from cheek to cheek. Several volunteers from local high schools, including Archbishop Carroll, Malvern Prep and Conestoga, played alongside the program participants. The clinic rewarded the volunteers, whom Brooks thanked after the game, with blue St. Monica’s golf shirts. Brooks also got a thank you from parents and participants. During the game, volunteers brought the ball past midcourt and distributed it to participants, who scored all the points, including shots banked off the backboard — a teaching principle Brooks tried to instill — and ones needing nothing but net. Comyns’ 19-year-old son had a knack for knocking down the outside shot without the backboard’s help. He said he saw his son’s confidence improve through the program, benefitting the adolescent’s nonverbal cues, including eye contact. No matter video games or basketball, the teenagers play just like any other kid. Freelance writer Brendan Monahan may be reached at bmonahan16@gmail.com.